Includes sophisticated financial charting library with 47 technical indicators. Extensible and customizable, and comes with source code. Also includes an Interactive Financial Chart sample program. 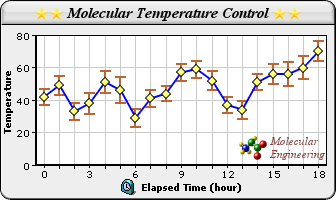 Full suite of mouse events (mouse click, mouse move, ...) for chart objects. Configurable pop-up tooltips. Adds sweep lines that tracks the mouse and optionally snaps to the nearest data position. 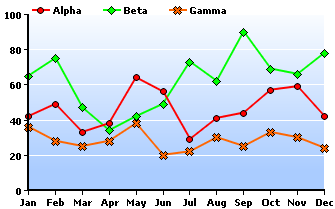 Displays the data values at the sweep line in the legend, dynamic axis labels or floating text boxes. Programmable behaviour for utmost flexibility. Controls zooming and scrolling by clicking and dragging on the chart. Also supports using other external controls such as scroll bars, zoom level sliders, date pickers and navigation pad. AJAX enabled for web applications. Powerful object oriented API allows you to customize every chart details. Extended color system allows all chart objects to be painted with semi-transparent colors, gradients, pattern (wallpaper), metallic colors or threshold colors (colors that depend on data values). Produces charts in PNG, JPEG, BMP, WBMP, GIF and SVG, and sends them to the browsers on the fly. No temporary image files on hard disk required. Viewable by virtually all browsers, including mobile devices. 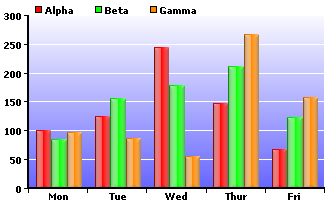 Charts can be embedded in email, word documents, PDF, etc. as images. No client side Java, Flash or ActiveX controls required.